There is a sign at Ticonderoga Club that reads: "We keep this joint and this joint keeps us (broke)." The scrappy quote seems appropriate coming from partners — and Atlanta restaurant royalty — Greg Best, Paul Calvert, Regan Smith, Bart Sasso, and David Bies. Between them, they have combined experience from Holeman and Finch, Restaurant Eugene, and Paper Plane. And it feels like they poured all of that combined institutional knowledge into their seven-month-old Krog Street Market tavern. Named after the 18th-century French fort in upstate New York near Best's and Smith's hometowns of Poughkeepsie and Binghamton, Ticonderoga's vibe is both eccentric and amusing. A perennially cheerful Smith greets diners at the host stand and surveys the room to ensure service is a step ahead of the customer. It always is. Multicolored Christmas lights dangle from the top of the bar, a framed John Travolta picture sits high on a shelf, and vintage stained glass lamps hang above the dining room's two patchwork leather booths. The shiny wooden bar feels like a modern riff on an old-timey saloon. Its sides are painted with the lower halves of colonially clad soldiers that, when viewed from just the right angle, align with the bartenders' visible upper bodies. It's an illusion — not a trick. Chef David Bies' return is a win for Atlanta. As Restaurant Eugene's former chef de cuisine, Bies demonstrated his fine dining artistry. After Eugene, Bies traveled throughout Europe, Central America, the Caribbean, and Southeast Asia for three years, and his affinity for the many different cuisines he encountered is evident at Ticonderoga. As unassuming as the restaurant looks, eating there feels like an explosion of glitter to the face. Fancies (small plates), dinner (larger dishes), and table sides (self-explanatory) comprise the menu. Only one item is served at lunch: the Spiedie, which is a tangy marinated chicken sandwich popular in upstate New York that's served on a sesame hoagie roll with shredded lettuce and a creamy mayo sauce. Ticonderoga also offers a funky little brunch on weekends. The actual menu is illustrated! For example, the Hard Back Breakfast — eggs over "Eazy" with meat, potatoes, and toast — is listed next to a caricature of Eazy E.
At dinner one night I fell in love with a thick slab of grilled foie gras — its fat smoky and caramelized — that was paired with finely chopped, rehydrated Michigan cherries and spread over buttery white toast. Bies looks to India for inspiration in his Sweetbreads 65 dish, a golden oval of shallot-encrusted sweetbreads served over tangy, cucumber-studded goat's milk raita. The fork-tender sweetbreads were spicy from the kashmiri chilies in the 65 sauce. I found that generous swipes through the cool yogurt tamed the heat nicely. Ticonderoga's vegan noodle bowl is the one dish I crave and must order whenever I'm there. It's a spicy veggie-heavy take on Singapore noodles coated in dry madras curry. The vermicelli tangles with whatever vegetables farmer friends bring that day. The three versions I have had contained everything from turnips to bok choy. Ticonderoga's Ipswich clam roll may be one of the best clam sandwiches in town, perhaps in the country. Bies personally picks up his clam bellies (the best part of the clam due to its rich flavor and texture) from the airport nearly every week. He coats the bellies in a light breading, fries them, and then stuffs them into a top-sliced white bun slathered in tartar sauce. The chef's Restaurant Eugene roots peek out in side dishes such as al dente hakurei turnips and asparagus bathed in an emulsified lemon butter sauce. A side of smashed potatoes crisped up with butter is like a fine dining homage to Waffle House hash browns. A smear of lemony crème fraiche and smattering of chives are the only embellishments, but the richness of the Yukon gold potatoes and bright crème fraiche make the otherwise simple side feel luxurious. After dining here numerous times, I have experienced just two missteps — one serious and the other less so. When you order Ticonderoga's three-pound sous vide chuck roast, the staff rings a bell near the bar and shouts, "Chuck wagonnnnnn!" The commotion causes everyone to turn their heads toward the platter of sliced beef doused in maître d'hôtel butter as it makes its way through the dining room. After waiting in hot anticipation, I plucked a medium-rare slice from the plate and got to cutting. It wasn't easy. The texture of the meat was so chewy it felt like I was eating beef bubble gum. The other slip was a side of wok-fried leafy greens that came out bitter and slightly burnt. For cocktail fans, having both Calvert and Best running the bar is like a dream come true. Calvert says the goal for the cocktail and wine lists was to keep them short and focused and to change them infrequently so people could rely on certain drinks being there. Smith and Calvert's relationships with distilleries and winemakers set the foundation for Ticonderoga's offerings. The cocktails are well balanced, but make no effort to mask the spirits' booziness. 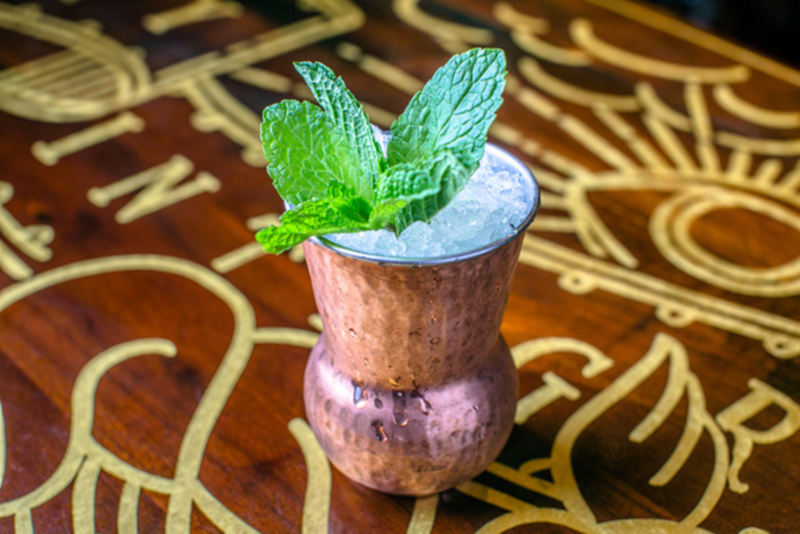 The house Ticonderoga Cup is a powerful punch made with rum, cognac, sherry, pineapple, and lemon poured over pellet ice packed into a copper cup and crowned with a sprig of mint. The Eveready is a spicy, sippable mezcal drink made fruity with the additions of lime, raspberry, ginger, and cucumber. Ticonderoga's food-friendly wine menu is a true connoisseur's list with 13 by-the-glass wines (sparkling, white, red, and fortified), 12 bottle-only, and one 12-year El Maestro Sierra Amontillado sherry. There are also several ciders, which are popping up everywhere right now, and beers on draft, in bottles, and in cans. Considering the partners' pedigree, Ticonderoga is refreshingly affordable for a place of its ilk. During a visit where my table ordered multiple drinks and more food than three people could ever eat, the bill came out to be $150. Calvert says they wanted Ticonderoga to be a place where you could come have a clam roll and a beer or throw down and buy a $200 bottle of vintage champagne if you wanted to.